Thursday 2 February 2017 was a big day here at the Competition and Markets Authority (CMA). In the morning we made the order that gives legal force to changes we want banks to make, so they work harder and smarter for their customers. 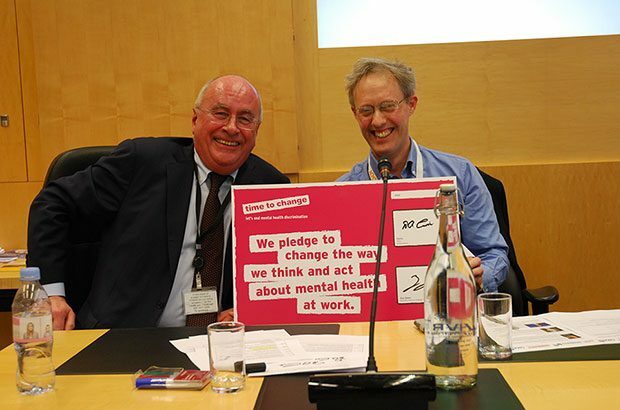 Then in the afternoon, our Chairman, David Currie, signed the CMA up to the ‘Time to Change’ pledge – to promote good mental health and eradicate the stigma associated with mental illness. I’m very proud of all the hard work that has gone into reaching both of these important milestones. As there is already a really healthy public debate about improving banking, I want to take this opportunity, a week on, to reflect on the major steps we have taken, both as an organisation and society, on wellbeing and mental health. Mental health is a very important subject for me. Earlier in my career I had a couple of episodes where I struggled with workplace-related stress, leading to anxiety and depression. These were difficult times for me, as you can imagine, as I sought to balance my responsibilities at home and work with the equally important need to take care of myself. As part of the CMA’s commitment to promoting equality and diversity I decided it was time to speak publicly about my personal experience, and share strategies I found helped me manage my own wellbeing. The reaction from colleagues was amazing. Unlike my normal presentations, nobody fell asleep for a start! Instead all the speakers at the session got a very warm and supportive reaction from those listening, and afterwards others started sharing their own experiences of mental health – in the meeting, by the tea point and over email. Two main things have struck me from these conversations. Firstly, effectively managing workplace stress and anxiety is a very important issue for all employers. My own difficulties had been largely triggered by work-related issues – at a central government department I had literally worried myself sick about whether I was underperforming, and in another role the pressures of being at the business end of a high profile project had become a bit too intense. A lot of colleagues clearly related to these experiences. As a member of the CMA’s senior leadership team, I think it’s vital that we organise ourselves and act in ways that enable the organisation to deliver results in a very challenging external environment, while safeguarding the health and wellbeing of the great people who work here. Secondly, as with any workplace, there are lots of other ways in which CMA colleagues can have their lives touched by mental health issues. Some people may be dealing with stressful situations at home – in these cases, work can sometimes be a source of comfort (getting away from the problem and doing something you’re really good at), though it can also be another load of ‘stuff’ to deal with. Others are supporting partners or family members through their own difficulties – I well remember the strain I placed on my wife when I was ill. A further group may have been dealing with mental health challenges for many years prior to joining the CMA – I cannot overstate how much I admire these people. Following our talk, and in light of the very positive response, we convened a small group – named, after extensive discussion, the Wellbeing and Mental Health action group – to work together to see what can be done to make the CMA a healthy, sane and supportive working environment. I want to thank everyone who has been part of this group for their commitment, ambition and organisational flair. To give some focus and profile to this group, we plugged into the great work of Time to Change (if you’re so inclined @TimetoChange on social media) who support employers seeking to make a similar commitment. We backed this up with an action plan designed to make a practical difference. Actions we’re taking include holding the CMA’s first ever Wellbeing Week last October, training a group of 20 ‘Mental Health First Aiders’ in January, piloting mental health awareness training for managers (the first course is this Friday 10 Feb) setting up a wellbeing peer support network, where colleagues can discuss emotional wellbeing difficulties and share tips in confidence. The impetus for all this work has been very much organic and ‘bottom-up’, but we have also had great support from the top of the organisation, particularly from our Acting Chief Executive Andrea Coscelli. This brings me round to Tuesday’s pledge signing. It came, aptly, just after the end of the football transfer window, though sadly David Currie wasn’t wearing his CMA tracksuit. As well as the signing of the pledge and presentation of our action plan, we invited 3 great speakers to provide an external perspective on the issues raised. Karen Shaw from Time to Change, placed our commitment into the wider context of their work. Katie Evans from Money and Mental Health opened our eyes to how mental health can affect us as consumers, as well as employees. Finally Adam Afriyie MP gave a very stimulating and wide-ranging talk drawing on his insights as an MP and entrepreneur. In the run up to the event, a number of colleagues took the brave decision to share their own experiences of living through mental health challenges. As with the banking remedies, Tuesday’s event was a really important moment for the CMA, but there is still work to do. Over the coming year, we’ll be implementing the actions we have committed to, continuing to encourage people to talk openly about how they’re feeling and promoting ‘wellness at work’ more broadly. In addition, building on some of the insights from Katie’s talk, I am also keen to explore how to apply the insights we are getting into mental health into our ‘day job’ of being a top notch consumer and competition authority. It should be fun, and it will definitely be important.